The adjustability of the car’s ride height with the QA1 coilovers definitely placed the car at the proper stance.It’s no secret that a coilover suspension is a true performance upgrade. This style of suspension allows for more adjustability than a standard coil or leaf spring setup. Since those suspensions have a segregated shock and spring, the consolidated design of a coilover definitely makes for a tantalizing upgrade. Darin Burgess owns a 1966 A-body Chevelle that was devoted to racing on the quarter-mile. The car has spent the last several years in retirement, but Burgess was now ready to clean the dust off the car and get back to racing. But, he also had a job status-change in store for the Chevelle. He no longer wanted the car to be a specialized racecar, he wanted to enjoy his classic on the highways of California. 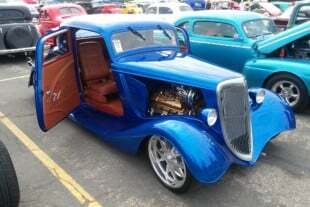 Burgess’ Chevy was like many traditional hot rod quarter pounders, it used coil springs, bolt-on ladder bars, and aftermarket drag-style shocks. It also had a stance that was up in the air, higher than it needed to be. 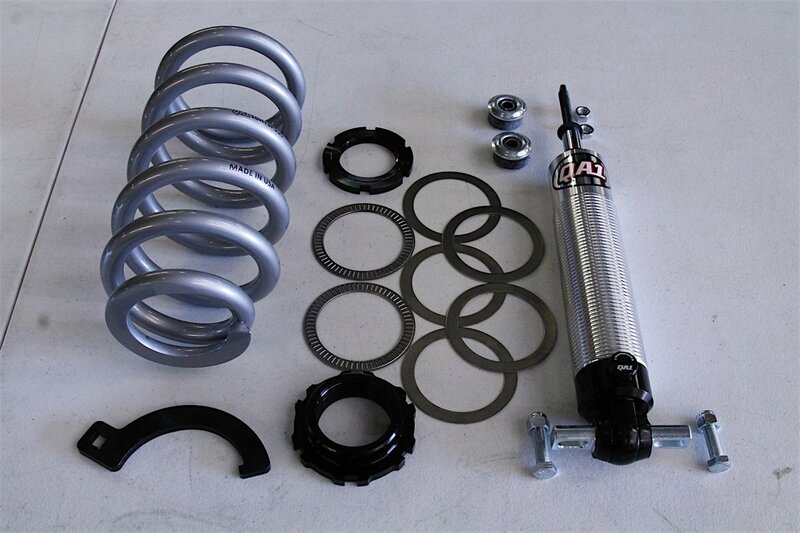 The bolt-on coilover kit comes with everything needed to install the coilovers, and help your car realize better launching capabilities. Just because Burgess wanted to have a car that was comfortably streetable didn’t mean he was willing to give up anything when he went to the track. He knew an upgrade was in order, and this is where the QA1 adjustable coilovers come into the picture. 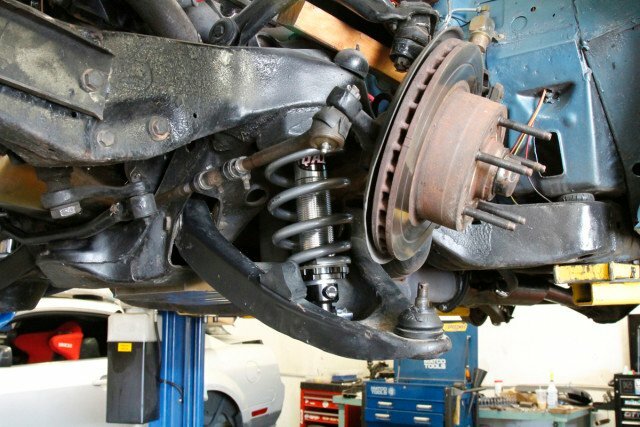 The rear suspension under a stock Chevelle is comprised of shock absorbers, coil springs, and a triangulated trailing-arm system to position the rear axle. When power is sent to the rear axle, the upper control arms are “pulled” upon, while the lower control arms deal with a compressing situation. When launching the car, the driver’s side front corner rises and the passenger’s side rear wants to squat. This reaction tries to lift the driver’s side rear tire off of the ground, allowing the tire to spin. Looking at each component that came with the kit, the impending install looked to be simple and straightforward. By using ladder bars, Burgess was able to control the movement of the Chevelle’s suspension, and drastically reduce tire spin and wheel hop. The way the bars connected to the car, they also create a suspension that is very stiff, and when used on the street, ladder bars can create a ride that is very harsh and uncomfortable. Since our intrepid drag racer wants to spend more time on the street with his car, this was an area that needed addressed. 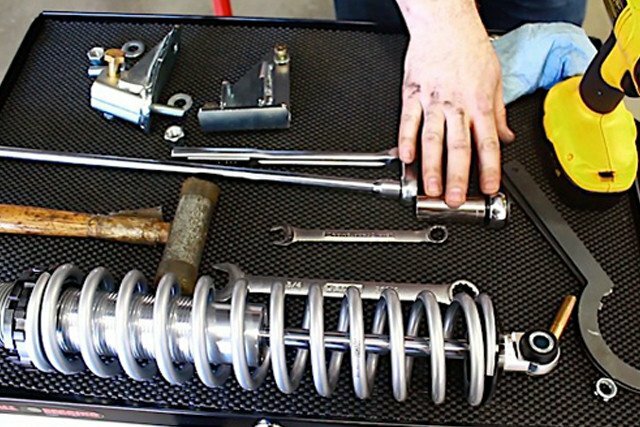 The coilover does need some basic assembly, but is an easy task only requiring the use of basic tools and patience to put it all together. Be sure to use an anti-seize of some sort on any threaded parts. By removing the ladder bars, it would seem that he would be introducing the opportunity for tire spin and wheel hop, but when the rear coil springs and segregated shocks are replaced by the QA1 adjustable coilovers, the adjustability to the dampening and rebound properties of the shocks will combat that situation. 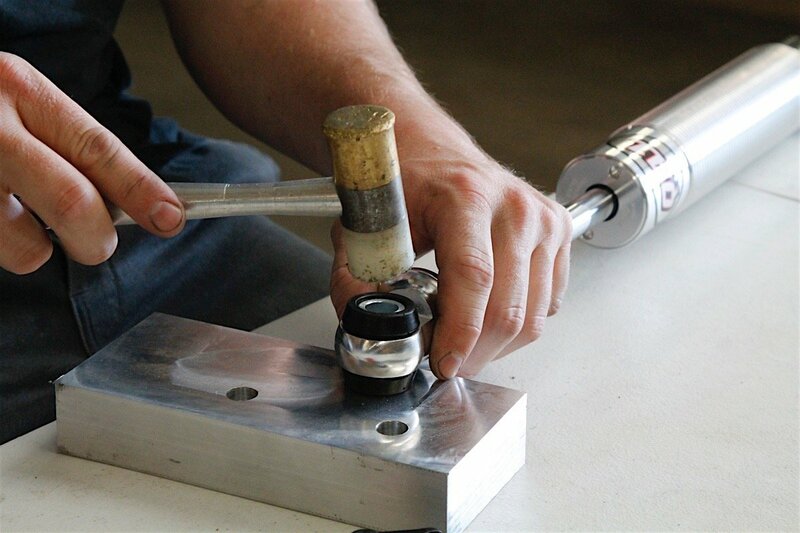 The coilovers are so easy to assemble and install, you can do it at home with simple hand tools. Keep in mind, after this swap, the factory trailing arms are still positioning the rearend, the QA1 coilovers simply allow for suspension adjustments. Other benefits affording with coilovers is the ability to also adjust the ride height of the car, and swap the springs to change the spring rate to adjust the car’s ride quality. This is a huge bonus, especially on a street car. Making this a complete conversion to coilovers, Burgess also decided to replace the front shocks and segregated coil springs with a set of QA1 coilovers. The reason for the change at the front is the same as the reason for the rear swap, suspension adjustablity in a street-friendly package. Weight is something to contend with when racing, and Burgess says the ladder bars weighed 17 pounds each, the front springs 14 pounds each, the rear springs 8 1/2 pounds each, and all four shocks were 7 pounds each. That was a total of 107 pounds of suspension components on the car. On the flip side the QA1 kit that is now on the Chevelle weighs 11.14 pounds each up front, and 12.25 pounds each out back. That brings the new components it to a grand total of 46.78 pounds. Not only do the coilovers give the car’s suspension much-needed adjustability, it also eliminated slightly more than 60 pounds from the car. To install the front coilovers, you will need to remove the welded nuts that hold the bottom of the shock to the lower control arm if they are still in place. Over the years, these often get removed, so your car might not have them anymore. The mounting of the coilover is the same as the factory shock absorber. In order to remove the stock springs and install the new coilovers, you will need to separate the lower ball joint. The factory springs are under pressure, so use extreme care when removing them. When utilizing the adjustable drag shocks and coil springs, the Chevelle’s suspension offered limited adjustability. Installing the QA1 adjustable coilovers boasted more versatility, as they have 18 settings of combined compression and rebound. 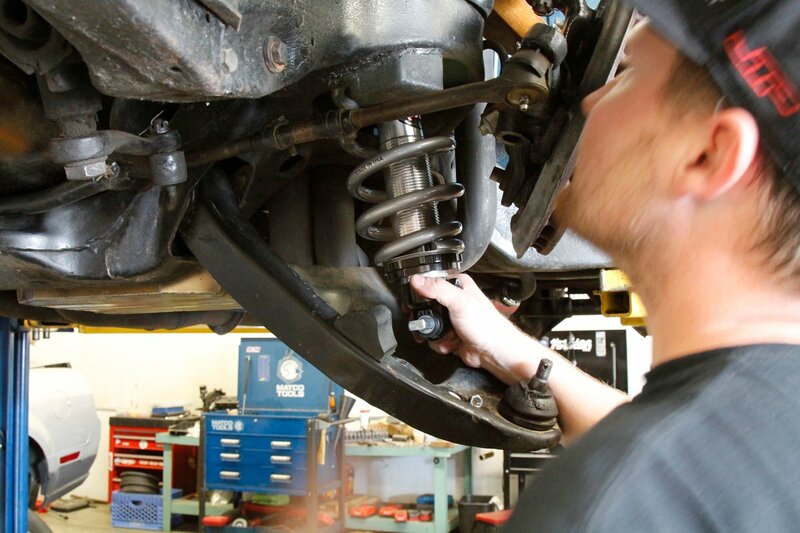 Adjustable shocks work by altering the valving rate at which the shock compresses and extends. This is especially important for racers, as it can make all the difference during race day if track conditions are substantially changing. In regards to any shock, the extension or rebound is the shock’s resistance to being pulled apart, while the compression rate is the shock’s resistance to the body settling back into ride height. 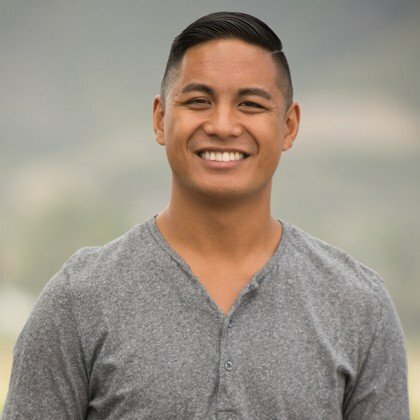 When making adjustments to the front shocks, you want the car’s front end to have a smooth transition from launch through the first gear change. If the front is bouncing it will decrease elapsed times. If the car physically jerks the front wheels off the ground during launches, the shock extension setting could be too soft. On the flip side, if the the extension setting is too stiff, the front end will not lift upward sufficiently to transfer weight. In regards to rear shocks, the proper shock setting will force the rear tires to bite the track surface as hard as possible. Do not forget, it’s the shocks that actually control how much force is being applied to the tires, not the springs. If the shock extension setting is too loose, you will encounter too much rear body separation, and limited weight transfer. The previous suspension components were easily removed to make way for the new coilover kit. The lift blocks are a real performance enhancer – NOT. If the extension setting is too stiff, the car will overload and compress the tires excessively or simply allow them to spin. Fine tuning these settings plays a vital role in how the chassis will act during the initial 60-feet of the quarter-mile. When a perfect balance of shock extension and compression is achieved, the car will launch hard and return to level, allowing for the quickest possible e.t. The coilovers being installed on the rear of the Chevelle are QA1’s RCK52340, while the fronts are part number GS501-10450A. 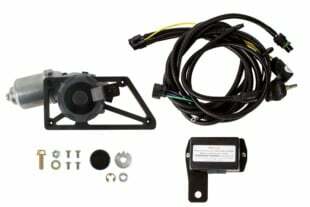 Both are a direct bolt-on application, and can be installed in the driveway by any do-it-yourselfer. 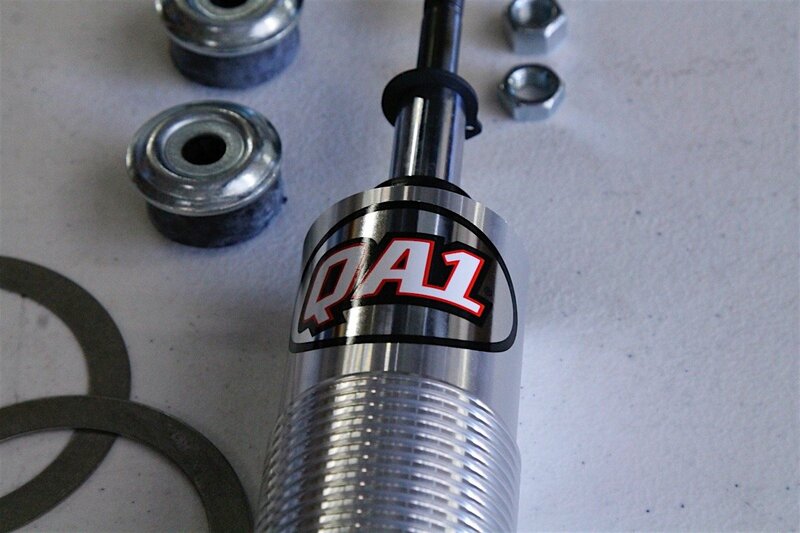 According to QA1, these shocks include spring rates that are carefully selected to maximize performance, while maintaining a smooth and comfortable ride. Burgess utilized QA1’s part number 14HT150 springs for the rear of the car, which are 14-inches tall, and have a spring rate of 150 pounds. The springs supporting the front are part number 10HTSP550, and measure 10-inches in length with a 550-pound rating. After drilling a single hole, the lower coilover mount was installed onto the rearend. The coilover bolts in place just like the OE shock absorber. Burgess began by removing the ’70s-era ladder bar-assisted suspension, which definitely showed its age. The shocks had seen better days, and the springs had lost a lot of their … well … spring, as evidenced by the lift blocks in the coils. Removing the old setup is a simple process that can be accomplished with normal hand tools, but it’s always nice to have a big hammer around, just in case. Although Burgess does have a lift in his garage, this install is relatively easy, and can definitely be done in the driveway. 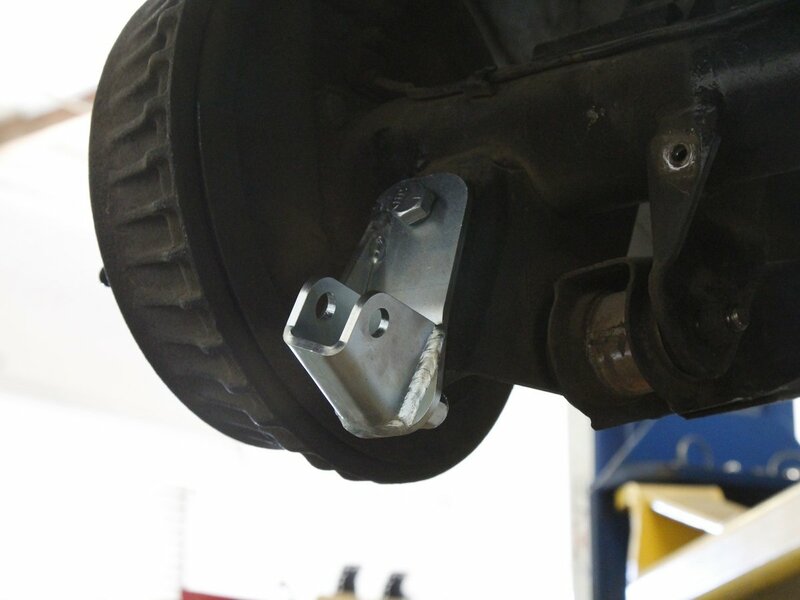 While a lift isn’t required for this install, having the option of standing under the car does make it much easier to inspect other suspension components like bushings. 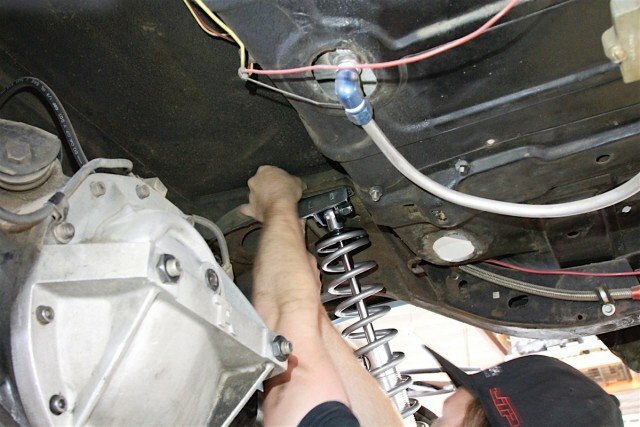 Burgess started at the front by removing the stock springs and shock absorbers, and then he measured the area where the new coilovers would be installed. He needed to be sure everything had adequate clearance prior to installation. 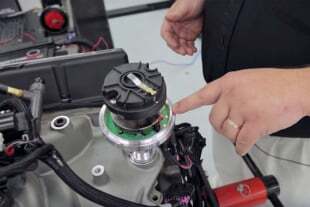 “Installation of the coilover is actually much easier than trying to install a factory spring, because you can adjust the coilover to be as short as needed, as opposed to the longer factory-style spring,” Brase said. The front QA1 coilovers use the factory mounting locations with an upper stud on the shock, and the lower T-bar mount that is made of 3/4-inch chromoly. A single through bolt mounts the coilover to the new bracket. If the welded nuts are still in place on the lower control arms, remove them so the T-bar on the coilover rests firmly against the control arm. After the nuts are removed, simply slide the top of the coilover into place, then the bottom, and secure it. Inside the shock there is oil that flows through an orifice as the shock compresses or extends. The size of the orifice and the viscosity of the oil determine how much resistance the shock has to compression or extension force. The adjustability of a shock has to do with changing the size of the orifice to increase or decrease the rate of oil flow. It has nothing to do with ride height. When it comes to installing the coilovers on the rear of the car, you will be using factory mounting locations. The Chevelle will retain the factory control arms, and we did no major cutting or welding during the install. The QA1 coilovers do use custom brackets that bolt to the car at the factory shock locations, and these then become the upper and lower mounting location for the new coilovers. “The upper brackets not only serve as a support for the coilover, but they also reinforce this area as well,” Brase said. With the upper brackets firmly secured, it was time to mount the lower brackets. 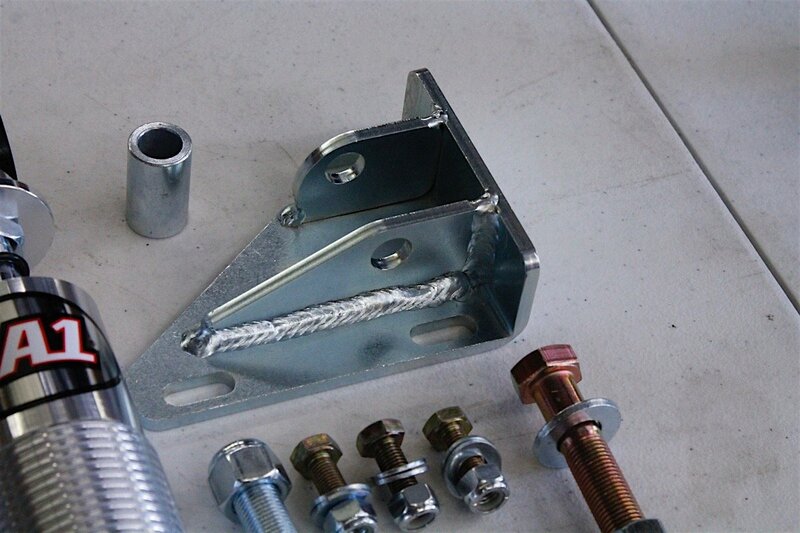 These are a bolt-on design, much like the top brackets. Per the instructions, Burgess did have to drill one hole in the lower factory shock-mount location for each lower bracket for the coilover. “This anchors the bracket in two locations for increased strength,” Brase said. Once these braces are in place, the coilover can be installed, and the ride height can be adjusted. 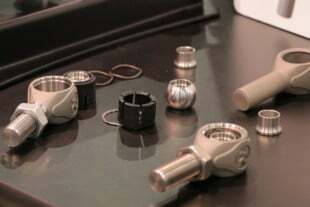 To prevent the springs from chewing on the adjuster nut, a bearing assembly is supplied. 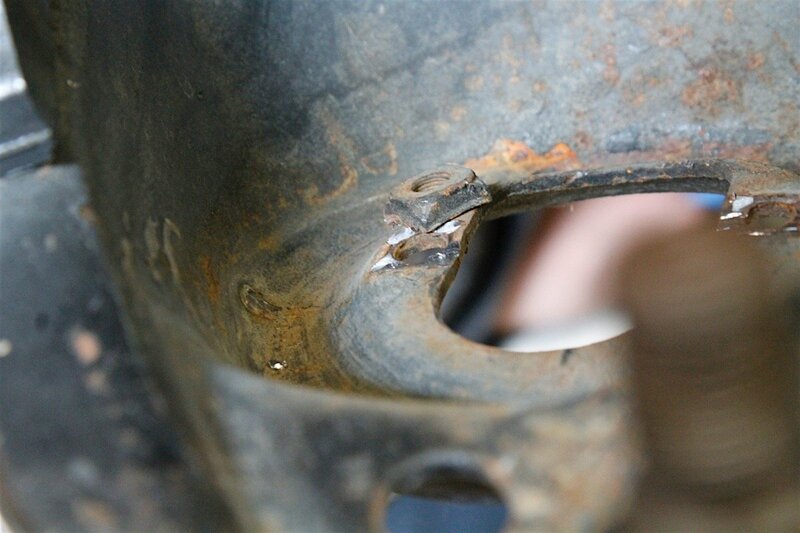 Always be sure to use anti-seize on all threaded areas to prevent galling. During the install, we did not experience any roadblocks or glitches. The process only required minimal drilling, and the upgrades were completed in a short amount of time. “The installation of the coilovers was very straightforward, and the fit and finish is very nice on this product,” Burgess said. The car’s ride height is changed by adjusting the spring on the coilovers. To raise the car, turn the collar up the shock body, and to lower the car, turn the collars down the shock body. The setup turned out clean and gives a fresh update to the 50-year-old American classic. So what are you waiting for? To see if there is a coilover kit for your specific vehicle application, check out QA1’s website to browse their catalog of performance products.